Created and inspired by building a call for a customer, using their own wood - Southern Long Leaf Heart Pine - this is a call that Bill will always have in his hunting vest. 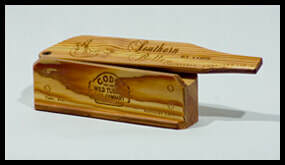 The first part of the award winning Drop Dead Series turkey calls, the 6.5 One-Sider box call. Cody didn't invent the box call...they just made it better. Cody Turkey Calls is proud to announce a new arrival to their line of award winning Drop Dead Series turkey calls, the Holei One Sider box call. Cody didn't invent the box call...they just made it better. This is a box call so profoundly different, the industry will never be the same! The Cody World Class has been used in and won many competitions. Chosen by world champions and professional guides nationwide, this call is available exclusively through Cody Turkey Calls, LLC. (Please call or write to check if we have this item in stock before ordering. Specify glass or slate. We only build so many of these calls a year...WE DON'T WANT ALL THE TURKEYS KILLED AT ONE TIME!) This call comes with a heavy hickory striker. 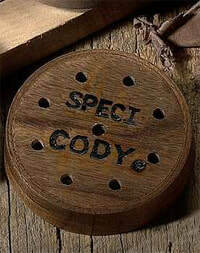 In 1987 Cody started working on the first wooden sounding board and it became the SPEC I in 1991. Designed and field tested 1991 to 1993, the SPEC I (like our other calls) can do everything a turkey can do. This call is a single glass or slate set in a laminated wood pot. It has already proven to be the #1 favorite of many callers and hunters. This call is only available through Cody Turkey Calls, LLC. It comes with a heavy hickory striker. Generally, these calls are not available upon request. Please feel free to order them and they will be shipped when ready. This call was designed by Bill Zearing, hoping that it would be his, and his son's personal call, and be the last slate call he designed. But after many years of this call being in the field, the world started hearing about the success of "The Legend", and we were being pressured into making this call available for sale. A few calls were given to close friends, and we never advertised or promoted the call, yet it's reputation from word of mouth and proof of performance was unbelievable. This call is one of a kind and will stand alone forever. The Legend's unmatched superiority is a product of Bill's knowledge in engineering and the science of building a premium turkey call. Originally, this call sold for $250.00 each, but we will now offer it for the first time for $225.00 a piece. The Legend comes in slate only each one will be matched and run by Bill himself. The Woodsman Drop Dead Series is a very different call then the Woodsman. Not taking anything from the Woodsman, but the Drop Dead call has been designed and built to be a different call. The Drop Dead Series is higher pitched and has unbelievable turkey tone quality. In the two years of field testing, this call has earned the name for itself. The Woodsman is a call that will be around for a very long time. 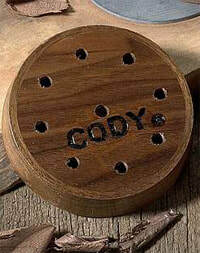 This call has been designed and built by Cody Turkey Calls, LLC. Using all their years of experience they have created a call of superior tone and durability. This call was created by using many of the same ideas from Cody's World Class and SPEC I calls. North American Hunter in field testing this call had a 9.7 over-all rating and a 100% approval rate. This call is a handmade call and sold for an unbelievable price. A heavy hickory striker comes with this call. This call is the sister of the famous Cody World Class call. Proven to be very effective for hunting or competition, these calls are available in slate or glass set in a walnut wood pot. A heavy hickory striker comes with this call. This call is the sister call built off of the SPEC I. The call is available in single slate or single glass set in a one piece walnut wood pot. This call is the ENVY of all call makers. A heavy hickory striker comes with this call.